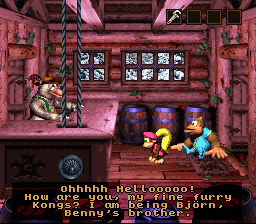 Björn's Chairlifts, called Björn's Chairlift in the Game Boy Advance version, is a chairlift service run by Björn at Razor Ridge in Donkey Kong Country 3: Dixie Kong's Double Trouble! It is located along the northern portion of the world, crossing over from the east side to the west. More specifically, it connects Kong-Fused Cliffs with Clifftop Cache, the Banana Bird Cave of the world. Initially, Björn's Chairlifts is out of service due to a malfunction caused by a Kremling. As such, Dixie Kong and Kiddy Kong are unable to ride unless they bring Björn his No. 6 Wrench, so that he can repair his chairlifts and allow them free admission at any time. This page was last edited on March 12, 2019, at 11:27.